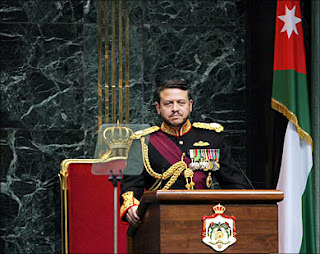 King Abdullah the second of Jordan has dissolved parliament. For the occasion he wore his favourite uniform, attaching on it the numerous medals and awards he has obtained throughout his distinguished career: the Order of Saint Sony, the Playstation 2 medal of accomplishment for levels achieved in Tekken 8 and finally the green, white and black medal as founder of the Jordanian Playstation 3 appreciation society. The CIA funded Jordanian intelligence services were unable to procure any Palestinians for sacrifice on this occasion but we are assured that Israeli and American officials granted the necessary blessings regardless, foregoing the obligatory blood sacrifice. too funny!!!!!!! why he dress like he's a character in a children's fairy tail book?? He looks upset, maybe he left Grand Theft Auto on pause..